The 2018 GEICO 500 was a Monster Energy NASCAR Cup Series race held on April 29, 2018, at Talladega Superspeedway in Lincoln, Alabama. Contested over 188 laps on the 2.66 mile (4.28 km) superspeedway, it was the 10th race of the 2018 Monster Energy NASCAR Cup Series season. Ty Dillon was the fastest in the first practice session with a time of 47.182 seconds and a speed of 202.959 mph (326.631 km/h). Jamie McMurray was the fastest in the final practice session with a time of 46.947 seconds and a speed of 203.975 mph (328.266 km/h). The practice was marred by a three-car crash on the back-straightaway that resulted in McMurray barrel rolling several times into the inside catchfence while Ty Dillon and Ryan Newman were also involved. “When I realized I was going to flip, I actually shut my eyes because I don’t really want to see what’s getting ready to happen,” McMurray said. “And then it just kept, it seemed like forever. I opened my eyes a couple times and I couldn’t, I’m like I don’t know if I’m going up or down or where it’s going to hit next. So I was just thankful when it finally … a couple of times I thought it was going to stop and it just kind of kept going.” McMurray's accident led to NASCAR reducing the restrictor plates from 7/8th to 55/64th of an inch. Kevin Harvick scored the pole for the race with a time of 49.247 and a speed of 194.448 mph (312.934 km/h). Fox Sports covered their 18th race at the Talladega Superspeedway. Mike Joy, six-time Talladega winner – and all-time restrictor plate race wins record holder – Jeff Gordon and four-time Talladega winner Darrell Waltrip called the race in the booth for the race. Jamie Little, Vince Welch and Matt Yocum handled the action on pit road for the television side. ^ "2018 schedule". Jayski.com. Jayski's Silly Season Site. May 5, 2017. Retrieved March 20, 2018. 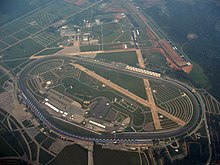 ^ "Talladega Superspeedway". NASCAR.com. NASCAR Media Group, LLC. January 3, 2013. Retrieved March 20, 2018. ^ "Entry List". MRN.com. Motor Racing Network. April 24, 2018. Retrieved April 24, 2018. ^ "First Practice Results". MRN.com. Motor Racing Network. April 27, 2018. Retrieved April 27, 2018. ^ "Final Practice Results". MRN.com. Motor Racing Network. April 27, 2018. Retrieved April 27, 2018. ^ "Qualifying Results". MRN.com. Motor Racing Network. April 28, 2018. Retrieved April 28, 2018. ^ "GEICO 500 Results". MRN.com. Motor Racing Network. April 29, 2018. Retrieved April 29, 2018. ^ "Points standings" (PDF). Jayski.com. Jayski's Silly Season Site. April 30, 2018. Retrieved April 30, 2018. ^ "Manufacturer standings" (PDF). Jayski.com. Jayski's Silly Season Site. April 30, 2018. Retrieved April 30, 2018. ^ "Talladega TV ratings". Jayski's NASCAR Silly Season Site. ESPN. Retrieved 7 May 2018. ^ Utter, Jim (April 27, 2018). "Ty Dillon leads the first Talladega Cup practice at 203mph". Motorsport.com. Lincoln, Alabama: Motorsport Network. Retrieved April 27, 2018. ^ Utter, Jim (April 27, 2018). "McMurray fastest, goes airborne in final practice at Talladega". Motorsport.com. Lincoln, Alabama: Motorsport Network. Retrieved April 27, 2018. ^ "McMurray wrecks hard in final Talladega practice". Official Site Of NASCAR. Retrieved April 27, 2018. ^ Zenor, John (April 28, 2018). "Harvick, eyeing 4th win of year, to start on Talladega pole". Associated Press. Lincoln, Alabama: AP Sports. Associated Press. Retrieved April 28, 2018.